Approximately 36 cats were found dead in a Bradley Beach, NJ, home on Sunday, after the residence’s fire alarm was triggered. Officials believe that the stench of the feline corpses and feces could have set off the alarm. A glimpse inside the house where 36 cats died. Lorraine R. Smith, 65, faces charges of animal cruelty after fire fighters and police entered her home. What they found were the corpses of 36 cats. Even wearing Hazmat suits, Society for the Prevention of Cruelty to Animals authorities could only spend up to 15 minutes in the residence, due to the overwhelming odor. The remains of the felines were scattered throughout the three-story house, and there were signs that some of the animals even tried to eat each other when the food supply ran out. 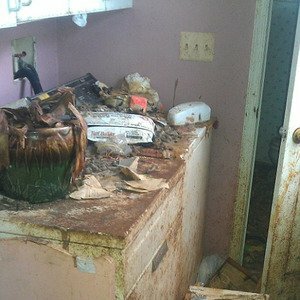 The residence was also littered with cat feces, in some areas the waste was a foot high. Amato thinks the cats were left on their own for about one year. Smith, a retired New Jersey school teacher, had moved from the Bradley Beach location to nearby Neptune, to care for her sick mother. Smith could face 36 counts of animal cruelty and $3,600 in fines. One next-door neighbor, Victor Caponegro, noticed large numbers of flies gathering on the windows inside of Smith’s house. He and other neighbors had complained about a nasty smell coming from the property. Smith is scheduled to appear in court next month.